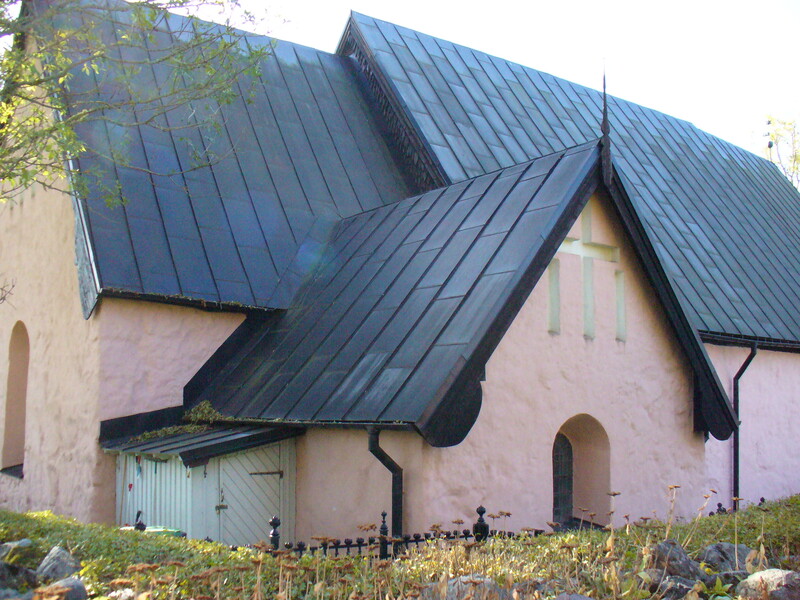 Yes, this church was pink. The church yard was incredibly small and the area was full of trees and hedges making it a bit difficult to get a decent shot. The description of this church’s history was a bit confusing, more than usual with my Swedish skills. It seems the sarkristian is the oldest part of this structure. Back then the original church was wood, but the sarkristian was not actually attached (I think that’s what it’s saying any way). After the wooden church was gone, the area just in front of the alter was added and finally the longhouse section of the church around it. Probably in the latter parts of the 1400’s came the final stage of construction which included a church building to the west and the vapenhuset (enclosed porch) to the south. If I’m understanding correctly, this construction history began in the 1200’s. There is also a sandstone baptismal font in the church from the same time period. An organ loft was added in the 1700’s.